Acer has taken the wraps off the world’s first 15-inch, 2-in-1 Chromebook, the Spin 15. It’s the first large-screened Chromebook that can adapt to different usage scenarios – from typing up spreadsheets to converting into a tablet to watch YouTube videos on. 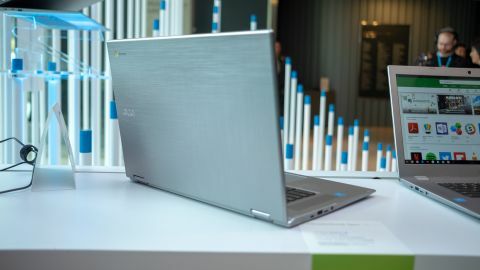 We’ve spent some time with the Spin 15 during Acer’s annual keynote event in New York City, and it certainly is a great pick for anyone looking big laptop that can last for the long haul. The Acer Chromebook Spin 15 starts at $449 or £499 when it lands in stores and online this July. Acer also teased a 13-inch version of the device, the first-ever Chromebook with Intel's 8th generation processors inside, aimed for business use. However, Acer has yet to reveal pricing and availability. The Chromebook Spin 15 sports a fabric-like, textured aluminium lid, but sadly that doesn’t continue inside, which sports a soft-touch plastic instead. It’s also here that we encountered an odd problem with the device – it’s significantly tricky to open. Try opening it with one hand and you’ll most likely fail to do so without flipping up the base as well. With two hands, you can’t a firm grip on the front lip, so you’ll need to really dig into it in order to pry it open. One you have gotten it open, you’ll be greeted by the Full HD screen, which though sharp, is really reflective. This glare made it a bit difficult when watching some videos on YouTube, as we kept seeing our reflection in the screen for scenes that were playing back darker videos. The wide bezels around the screen are also something we’re not too happy with, but given the price tag of this device it’s going to be something we’ll have to accept. The keyboard feels similar to other Chromebooks we’ve tried, with a slightly softer key press that makes you second guess if a keystroke has been registered or not. The touchpad features Corning Gorilla Glass for a smoother experience, and generally responded quite well while scrolling through web pages or navigating around. Two upward firing speakers lank the keyboard. They’re surprisingly loud when playing back media such as music or videos, but the obvious downside is when the Chromebook Spin 15 is flipped over into the tent or tablet mode, the speakers are firing away from you, so the audio quality suffers considerably. It also feels a bit comical to be using a 15-inch tablet for anything other than drawing with, but there’s no bundled pen input here, so you’re probably only going to be using the tablet mode for watching movies when lying in bed. For connectivity there’s two USB 3.0 Type-A ports, a USB 3.1 Type-C port, and a microSD card reader. Powering it is a choice of three Intel processors, from two dual-core Celeron chips to a quad-core Pentium CPU. That's topped off with 4GB to 8GB of memory and 32GB to 64GB of eMMC storage. Acer claims that the Chromebook Spin 15 can delivery up to 14 hours of battery life, which is a significant feat for anyone planning to use the device for serious chunks of time during the day. Performance-wise the Chromebook Spin 15 felt quite responsive with launching apps, and had no issues with multiple tabs open in Chrome or watching HD videos fullscreen. The touchscreen was also very responsive to every tap and swipe, no matter which mode we were using the device in. While the Chromebook 15 is for those seeking a straight-up laptop version, the Chromebook Spin 15 plays with the design a bit further to provide a slightly more versatile device. It’s certainly great for anyone who enjoys watching copious amounts of YouTube videos or Netflix, and in the correct light you could actually enjoy watching content on the screen. The price is certainly comfortably placed as well, so with all things considered, the Chromebook Spin 15 actually gets our nod of approval. We’ll have to take it through its paces properly before giving our final verdict, so stay tuned for a full review.